Composition Scheme is a simple and easy scheme under GST for taxpayers. Small taxpayers can get rid of tedious GST formalities and pay GST at a fixed rate of turnover. This scheme can be opted by any taxpayer whose turnover is less than Rs. 1.0 crore*. *CBIC has notified the increase to the threshold limit from Rs 1.0 Crore to Rs. 1.5 Crores. What are the conditions for availing Composition Scheme? How can a taxpayer opt for composition scheme? What documents should a composition dealer issue while making supply? What are the GST rates for a composition dealer? How should GST payment be made by a composition dealer? What are the returns to be filed by a composition dealer? What are the advantages of Composition Scheme? What are the disadvantages of Composition Scheme? A taxpayer whose turnover is below Rs 1.0 crore* can opt for Composition Scheme. In case of North-Eastern states and Himachal Pradesh, the limit is now Rs 75* lakh. As per the CGST (Amendment) Act, 2018, a composition dealer can also supply services to an extent of ten percent of turnover, or Rs.5 lakhs, whichever is higher. This amendment will be applicable from the 1st of Feb, 2019. Further, GST Council in its 32nd meeting proposed an increase to this limit for service providers on 10th Jan 2019*. As per 32nd GST Council Meeting held on 10th Jan 2019, Service Providers can opt into the Composition Tax Scheme, and the Government has set the threshold turnover for service providers at Rs. 50 lakhs to be eligible for this scheme. 3. What are the conditions for availing Composition Scheme? If a taxable person has different segments of businesses (such as textile, electronic accessories, groceries, etc.) under the same PAN, they must register all such businesses under the scheme collectively or opt out of the scheme. The taxpayer has to mention the words ‘composition taxable person’ on every notice or signboard displayed prominently at their place of business. The taxpayer has to mention the words ‘composition taxable person’ on every bill of supply issued by him. As per the CGST (Amendment) Act, 2018, a manufacturer or trader can also supply services to an extent of ten percent of turnover, or Rs.5 lakhs, whichever is higher. This amendment will be applicable from the 1st of Feb, 2019. Earlier the limit was up to Rs 5 lakhs. 4. How can a taxpayer opt for composition scheme? Here is a step by step Guide to File CMP-02 on GST Portal. 5. How Should a Composition Dealer raise bill? A composition dealer cannot issue a tax invoice. This is because a composition dealer cannot charge tax from their customers. They need to pay tax out of their own pocket. Hence, the dealer has to issue a Bill of Supply. The dealer should also mention “composition taxable person, not eligible to collect tax on supplies” at the top of the Bill of Supply. 6. What are the GST rates for a composition dealer? 7. How should GST payment be made by a composition dealer? GST Payment has to be made out of pocket for the supplies made. *Only on the specified categories of goods and services and well as the notified class of registered persons with effect from 1st Feb 2019 but is yet to be notified. Hence, not applicable until then. 8. What are the returns to be filed by a composition dealer? A dealer is required to file a quarterly return GSTR-4 by 18th of the month after the end of the quarter. Also, an annual return GSTR-9A has to be filed by 31st December of next financial year*. Also, note that a dealer registered under composition scheme is not required to maintain detailed records. 9. What are the advantages of Composition Scheme? 10. What are the disadvantages of Composition Scheme? The taxpayer will not be eligible to supply exempt goods or goods through an e-commerce portal. 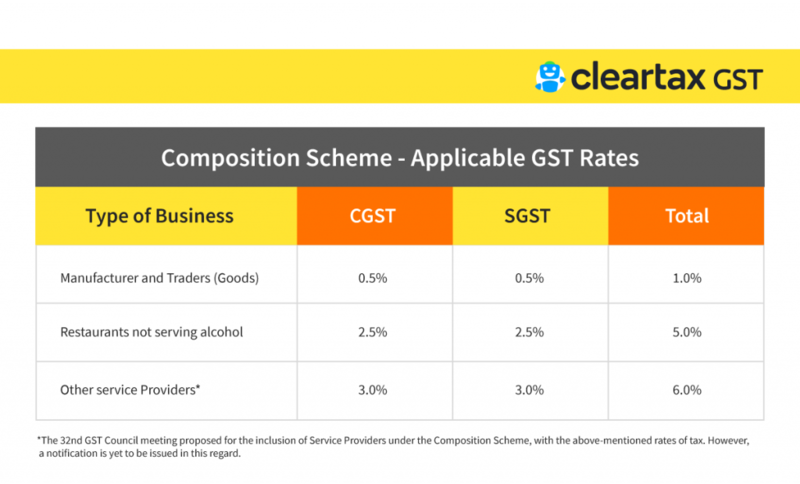 Learn all about the scheme available for Service Providers to opt into a composition-like scheme where a lower rate of GST at 6% is charged. Restaurants have options under GST to be a composition dealer or be a regular taxpayer. Each of it has its own pros and cons. This article elaborates the available options. A GST taxpayer who wants to opt for Composition Scheme has to file form CMP-02. 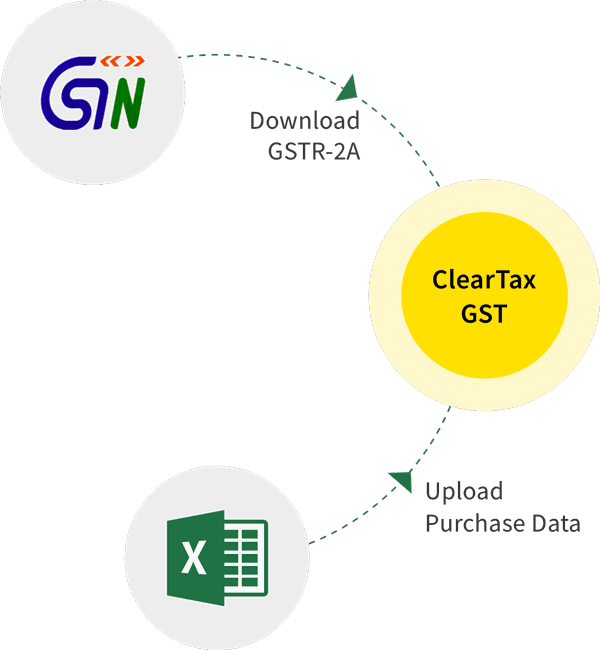 Here is a guide to file CMP-02 on GST Portal. Opted for Composition Scheme under GST? You have to file CMP-03 within 90 days of opting in. Here is a guide to file CMP-03 on GST Portal. Let us look at chapter 2 of CGST rules - Composition Rules. This text is taken from cgst-rules-01july2017.pdf. Composition Scheme Rules under GST w.r.t. intimation for Composition Scheme, effective date for levy, conditions and restrictions, validity and rate of tax. To help small businesses avoid the hassles of GST, the Model GST law has proposed a simpler levy. This levy is called Composition Levy. Reasons why you should avoid registering as a taxpayer under composition scheme.